Most Thursday nights, our family joins two other families for what we all call “Dinner and a Show.” We congregate at one of our houses, the kids play together and we all enjoy some appetizers. The kids (seven of them, between the ages of 4 and 9) eat first and then settle in to watch a movie while the adults sip wine and enjoy a nice dinner together. It’s a great tradition that we all look forward to. At one of these dinners not so long ago, “Homework” made a disheartening visit. After the kids had eaten, they all snuggled down in comfy chairs and couches in front of the fireplace for the movie. All of them, that is, except Kelsey, the nine year old. She obediently trudged upstairs to work on homework. After quite a while, Kelsey’s mother went upstairs to see how she was doing. She returned about 10 minutes later, letting us know that Kelsey was working on math. After another 10 or 15 minutes, her stepfather went up. When he returned, he said she was making progress. After another 10 or 15 minutes passed, I went up to see how Kelsey was doing. It had been more than an hour. Kelsey had finished four math papers and was now practicing her spelling words. She was tired and quiet, resigned to the amount of work she had. Honestly, I thought she could have been more upset. While everyone else had been downstairs enjoying a movie, Kelsey had been upstairs plugging away at work that was repetitive, low-level, and boring. It took another hour for her to finish. 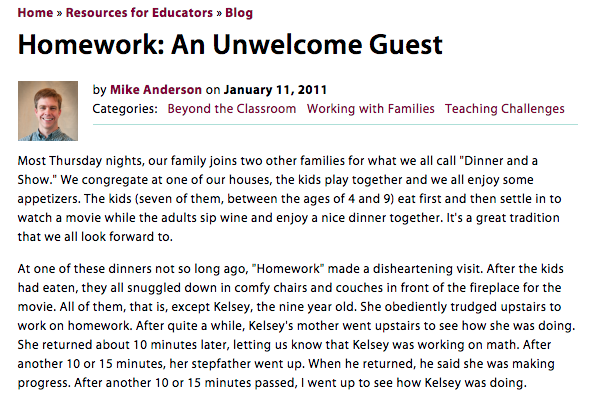 As we thought about (and checked in on) Kelsey throughout dinner, the adults at the table talked about homework. Although there were a range of opinions expressed, the general consensus was that Kelsey clearly had too much that night. I felt compelled to note that none of the adults had missed any of the evening’s events because we had to do work at home. Keep it brief: Five to ten practice problems in math are probably just as good as two pages. Give some choice: When possible, allow students to make some choices about their homework. 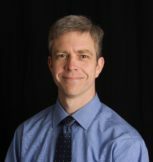 For example, when studying angles, student might be able to choose between completing a simple worksheet about the acute, obtuse, and right triangles or doing a scavenger hunt around their home looking for samples of each type of angle. Assign work that can be done independently: Many children don’t have family who can help them with work that is too complicated for them to do alone. Keep homework simple enough so that students can be successful on their own. Keep it relaxed: Make sure students know that it’s not the end of the world if they miss an assignment. A simple note from a parent or guardian should allow students to skip a night of work when other things at home need to take precedence. For an in-depth exploration of homework, I highly recommend Kathy Vatterott’s recent book,Rethinking Homework (ASCD, 2009).